Rod Hall, 72, and his son Chad Hall won their respective classes racing Hummer H3 Alphas in the 2009 SCORE International Baja 1000, marking the 20th and 21st victories for Team Hall in the event's 42nd year. 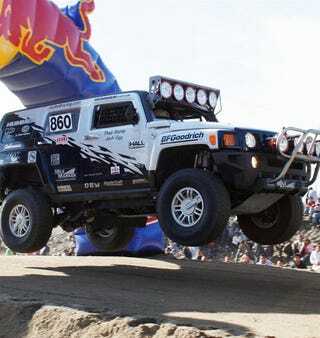 DETROIT – Rod Hall Racing once again demonstrated the inherent off-road capability of the HUMMER H3 as the team secured both the stock full and stock mini class wins at the 2009 SCORE International Baja 1000. The #860 H3 Alpha, piloted by Chad Hall, captured the stock full class victory, while team owner Rod Hall partnered with Emily Miller and Mike Winkel to earn the stock mini class win with the #761 H3. With the combined wins, Rod Hall holds the record of 21 Baja 1000 class wins and remains the only racer to have competed in all 42 Baja 1000 competitions. The 2009 SCORE International Baja 1000 marked the 42nd anniversary of the grueling off-road race and covered 672.85 miles, starting and finishing in Ensenada, Baja California, Mexico. It ran from November 20-21, 2009. "Off-road motorsports is an integral part of HUMMER's vehicle development process and a cornerstone of the brand's DNA," said James Taylor, HUMMER CEO. "We're extremely proud of the team's resilience to earn these stock class victories and congratulate the Rod Hall Racing program on another successful Baja 1000. Race after race, they continue to prove the rugged nature of HUMMER vehicles." In the stock full class, Chad ran a trouble free race in the #860 H3 Alpha, finishing in 22:48:40 hours and averaging 29.50 mph. While the team won the class by more than four hours, they battled the nearest competitor's Dodge Ram 2500 for the entire race until the Ram suffered a broken front axle less than 30 miles from the finish. The victory marked the third consecutive Baja 1000 in which the H3 Alpha was the first stock class vehicle to finish the race and was Chad Hall's eighth Baja 1000 class win. "These production trucks are the right size. They're fun, take a lot of abuse and just keep running and running," said Rod Hall. "You'd be surprised at how much abuse the H3 can take." In stock mini, the team suffered an early 100-mile deficit as a result of a broken steering rack seal caused by a significant impact to the front end of the #761 H3 near race mile 40. Despite the odds, the team battled back to pass the class leader less than 30 miles from the finish line and post a winning time of 28:53:30 hours. One of the three Halls has been the driver of record behind the wheel of a HUMMER on a class-winning team in the SCORE Baja 1000 for the ninth straight year and 13th time in the 16 year-history of the stock class. With 33 class wins, the Halls continue to be the winningest family in the history of the race. Rod Hall Racing was founded by legendary off-road racer Rod Hall and joined forces with HUMMER in 1993. Since then, Rod and his sons Josh and Chad have compiled 18 class wins at the Baja 1000; countless podium finishes in the Best in the Desert (BitD) Racing Association series; two SCORE International class championships; and eight BitD class championships. Rod Hall Racing competes internationally in some of the planet's most grueling off-road races. They currently race the HUMMER H3 and H3 Alpha in the stock class, which features production-based vehicles with stock frames, stock suspension designs and production-based engines. For more information about Rod Hall Racing, visit www.rodhallracing. HUMMER is a premium all-terrain vehicle manufacturer, with a product line-up that consists of the H2, H2 SUT, H3 and award-winning H3T. HUMMER models are available today in 38 countries around the globe.